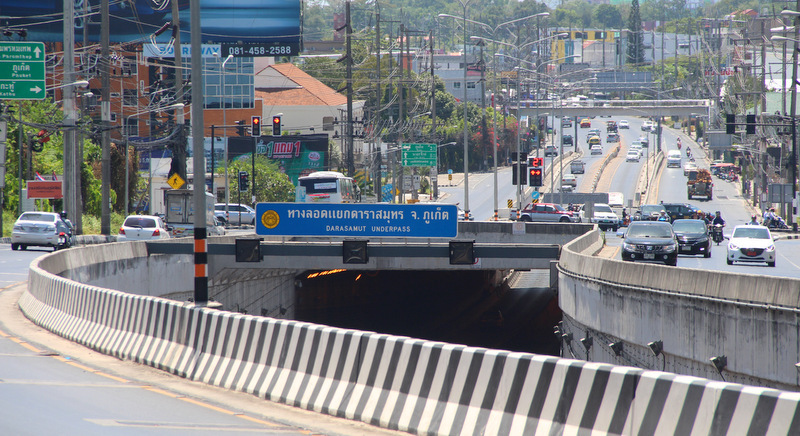 PHUKET: The Darasamut Underpass in front of Central Festival Phuket will close today (Mar 6) from 10am to around 1pm, the Deputy Director of Phuket Highways Department confirmed to The Phuket News this morning. “We will close the underpass today from 10am until around 1pm. One of the four water pumps are broken, so we will remove it and fix it, then put it back in,” said Deputy Director Pijak Sonchana. “The works will require bringing a crane in to get the pump out,” he added. Meanwhile, the signal light issue which was brought to attention last week is said to still have not been fixed, according to Highways Department electrical technician Warakorn Jawana. “We are waiting for some repair parts to be delivered from Bangkok. It depends when they arrive,” he said. “We will conduct multiple repairs at once,” he added.